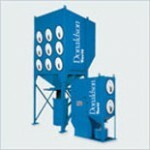 FAB-TECH Offers a wide variety of Dust Collection products. AT Industrial Products has been building quality ATI wet dust collectors since 1989 (prior to 2012, the wet dust collector model was known as CAT). Our unique, patented design is often copied; however, like most forgeries, none are as good as the original! AT Industrial Products is now expanding the successful ATI wet dust collector line to include new models and more options. heavy gauge steel construction with durable outdoor coatings provides assurance to the owners that they can count on longevity that matches the quality construction. All our cartridge dust collectors are shipped standard with photohelically controlled reverse pulse filter cleaning, digital pressure gauge, weatherproof control panel and drum lid kit. Donaldson Company was founded in 1915 to provide filtration solutions and has long established itself as the global leader. The predominance of all those blue collectors across a wide array of industries is testimony to Donaldson Torit’s industry leadership. Donaldson Torit provides dust and mist collectors, as well as filters and parts that are engineered to provide the best available filtration efficiency and energy savings. Donaldson Torit can provide exactly what you need.